Yes, Diwali is right round the corner, closely followed by the official Shaadi season in India. It’s time to bring out some bling and strut your stuff while you hop from one party to another. This year, give the voluminous Indian silhouettes a miss, and adopt androgyny in Indian wear. Androgyny as a trend has been around since the time ‘normcore’ became mainstream. A minimalist and a non-conformist approach to gender-neutral clothing. The trend in Indianwear takes cue from streamlining voluminous silhouettes in native handwoven textiles and embraces easy shapes, clean lines and longer silhouettes in body-skimming fabrics. We give you some quick tips to keep it stylish while keeping the bank balance in check. Raid your husband (or boyfriend’s) wardrobe and pick out some key pieces that you could incorporate into your Diwali outfits. When choosing separates for this trend, it’s all about contrasting fits. Pair slim fitted shapes with masculine cuts. Layering also plays an important role. Wear a broad shouldered jacket over a flowy feminine anarkali. One piece of clothing that we love in a guy’s wardrobe is a dhoti. We suggest you raid your man’s Indian wear and don the look. Pair a simple solid colored kurta with his dhoti. Accessorise with layered silver jewelry and jootis. Throw in a ‘paranda’ for the drama and if you have short hair a waterfall braid perhaps. Now if you cannot find a dhoti to drape, fear not. The markets are abundant with ready to wear dhoti’s or dhoti pants. This look commands loads of attitude and whole lotta swag. 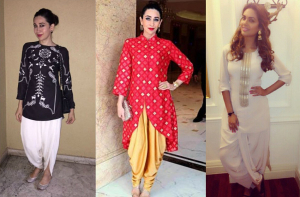 Karishma Kapoor has been slaying this look! Another timeless piece of men’s wear that we love is the Nehru jacket. 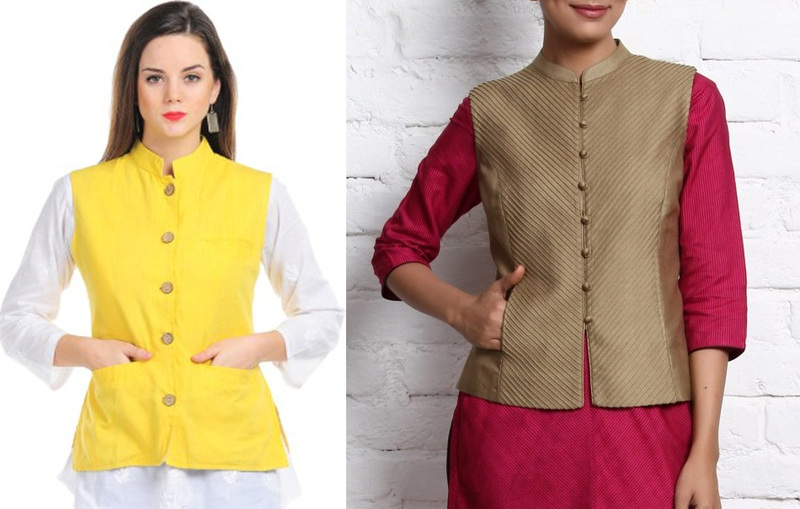 Wear Nehru jacket with a crisp kurta and churidaar. Keep the accessories strictly masculine with this look, for the win. Big dialled watch, a pocket square perhaps and flat kolhapuri chappals. Bring in your femininity with some chandbali earrings in pearl. Did anyone see Deepika Padukone rock some serious style at her Tamasha music launch? She serves as the best example of doing androgyny in Indianwear recently. We absolutely loved her long jacket over distressed denims. So effortless and chic! To steal the look, pair your man’s sherwani jacket or ‘bandhgala’ with rolled up jeans and a pair of sneakers. If you’d like to keep it dressy, wear strappy sandals or stilettos. Pull your hair back in a bun and let the world be at your feet. This is a perfect pick for a person who is slightly bottom heavy. Peplum was an Indian thing way before the west picked it up. Case in point, the ‘kedia’. Principally worn by Gujarati men during Garba, the shirt with its gathered fabric can be a great pick for a casual Diwali dinner party. 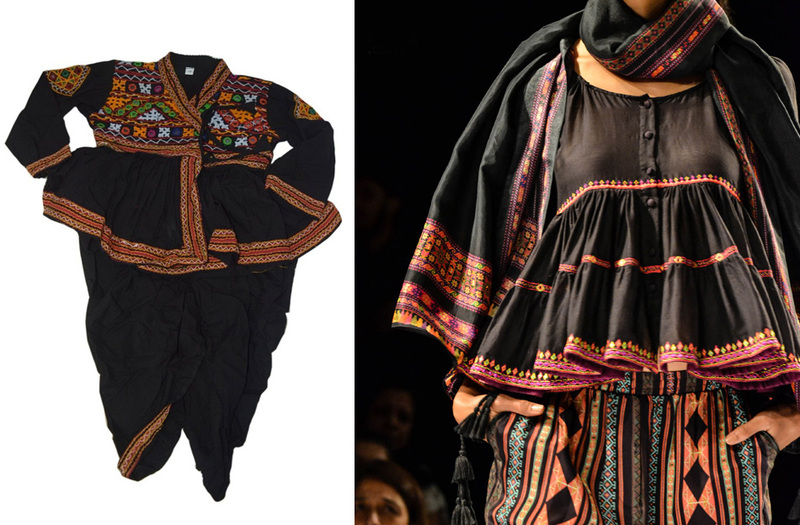 Traditionally embellished or embroided [with Kutchi work], pair the shirt with slim fitted cigarette pants. Alternatively, you could pair them with dhoti pants. Pointed pumps and some traditional earrings could complete the outfit. For added effect, tie your hair in fishtail braid. The thing to notehere is to downplay the volume of the ‘kedia’. They say style has a lot to do with attitude than actual pieces of clothing. Own the pieces you wear and you will rock any party you are at.